In order for us to go from strength to strength, it is important to have new parents with new ideas involved in the Committee. As parents ourselves, we understand the demands on your time and any involvement with the association or its activities is greatly appreciated. It is also a great way of meeting other parents. The Committee meets monthly during the school year. The meetings last for an hour or so. 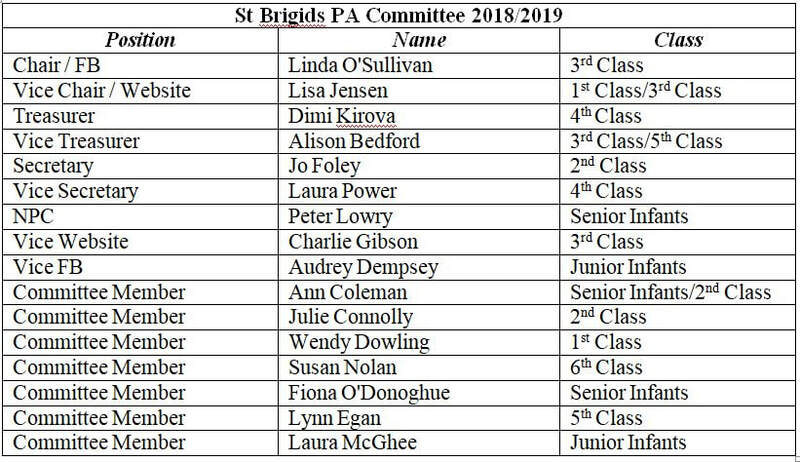 For further information please feel free to contact any of the current members, email us at: stbrigidpa@gmail.com or call us on 086 61967194. A new Committee is elected at our AGM in September/October every year. Do you have a query on any aspect of your child’s education? The NPC Information/Helpline is a confidential service for parents. The Information/Helpline officers listen, and give information and support to parents to help them make the best possible decisions for and with their children. If you have a query on any aspect of your child’s education please contact the Information / Helpline on Tel: 01-8874477 email: helpline@npc.ie. Finally We would like to thank you for your continued support and would like to remind you that we are all part of the school and if you have any comments, suggestions or would like to lend a hand please contact a member of the parents committee, send us an email, stbridigpa@gmail.com or call us on 086 1967194. There is also a suggestion box beside our noticeboard, if you wish to drop us a note this way. For more information on PA events, please visit our Events page and our News Blog. The following links have been recommended by the PA for parents. However, St. Brigid's school does not take responsibility for the content of external websites.